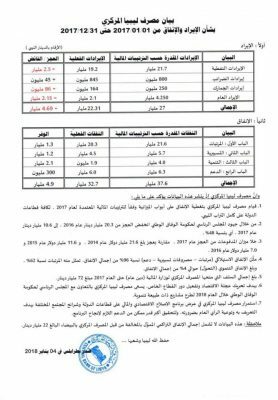 The Tripoli-CBL reveals Libya’s finances in 2017 (Source: CBL). 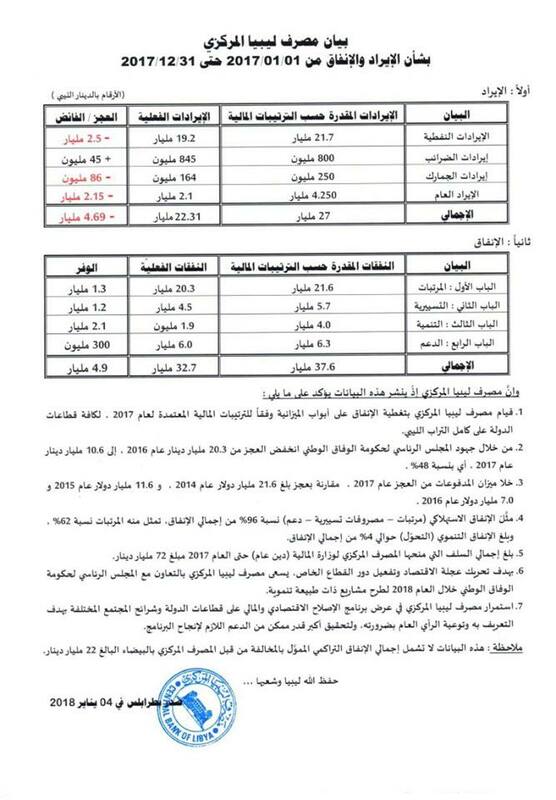 The Tripoli-based Central Bank of Libya (CBL) has released the latest figures for the Libyan economy covering the period 01/01/17 to 31/12/17. The figures continue to show the Libyan economy in budget deficit with total state revenues in 2017 barely covering state-sector salaries alone. However, the deficit was down by 48 percent from LD 20.3 bn in 2016 to LD 10.6 bn in 2017. Libya’s foreign balance of payments was in credit for the first time since 2014. The CBL revealed that it has had to cover a total of LD 72 bn of deficits in the form of loans to the Ministry of Finance since 2011. This figure, however, did not include the LD 22 bn spent ‘‘illegally’’, according to the Tripoli CBL, by the Beida CBL. Total actual state revenues were down by LD 4.69 bn, from a projected LD LD 27 bn to LD 22.31 bn. Oil revenues, the main state source of revenue, were down by LD 2.5 bn from a projected LD 21.7 to LD 19.2. Non-oil revenues came in at LD 3.11 bn, down by LD 2.19 bn from the projected LD 5.3 bn. Tax revenues were actually up by LD 45 million from a projected LD 800 million to LD 845 million. Customs duties were down by LD 86 million from a projected LD 250 million to only LD 164 million. Other revenues were down a huge LD 2.15 bn from a projected LD 4.25 bn to LD 2.1 bn. The CBL credits the efforts of the Serraj-led Presidency Council/Government of National Accord (PC/GNA) for the reduction in spending and hence the total budget deficit. Total spending was down by LD 4.9 bn to LD 32.7 bn from a projected LD 37.6 bn. A breakdown of state spending shows that the previously runaway state-sector salaries were down by LD 1.3 bn to LD 20.3 bn, from a projected LD 21.6 bn. The operational budget was down by LD 1.2 bn, from a projected LD 5.7 bn to LD 4.5 bn. State subsidies were also down by a smaller amount of LD 300 million, from a projected LD 6.3 bn to LD 6.0 bn. Nevertheless, the finances of the Libyan state are still unbalanced with state-sector salaries taking up 62 percent of spending and together with operational spending and subsidies they take up 96 percent of total state spending. Sadly, and worryingly from a development point of view, spending on development projects were down by LD 2.1 bn from a projected LD 4.0 bn down to just LD 1.9 bn which constituted about 4 percent of total 2017 state spending. The CBL also revealed that there was no deficit in Libya’s balance-of-payment in 2017, which contrasts markedly with a US$ 21.6 bn deficit in 2014, US$ 11.6 bn deficit in 2015 and US$ 7.0 bn deficit in 2016. These would have been met from its foreign currency reserves amassed during the Qaddafi era years when oil production was around 1.5 million bpd and the international crude oil prices were around the US $100/barrel. Libya is currently producing around 1.1 million bpd and Brent crude is currently quoted at around US$ 68 p/b.